The border between Tugurmiti Township and the Kyrgyz Republic stretches more than 80 kilometers. Now, about 2,000 border protection workers reside in the township. After performing a routine four-hour patrol, 42-year-old Mehmet Kasim takes a break. A few years ago, the man from the Kirgiz ethnic group made a living by grazing sheep. Like many of his neighbors in Tugurmiti Village of Tugurmiti Township in Atux City of China’s Xinjiang Uygur Autonomous Region, Kasim now works as a border patroller. 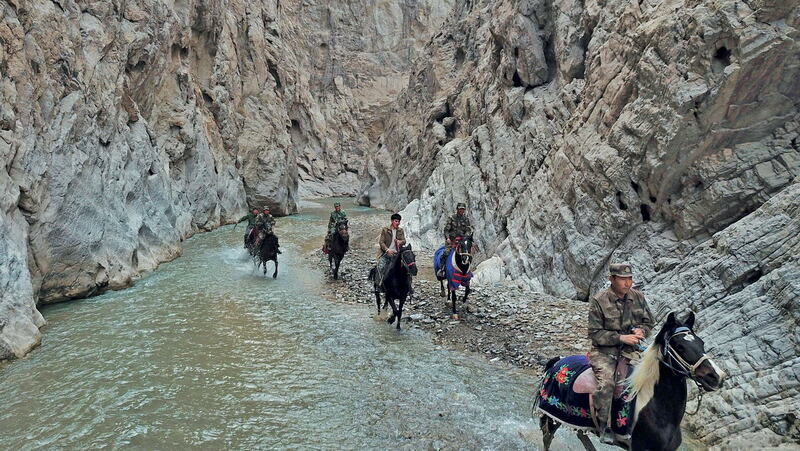 Dressing in a camouflage suit, he rides a horse to patrol the border almost every day. Many areas like Tugurmiti in southern Xinjiang are home to a variety of Chinese ethnic groups. They are situated near the border, and many are poverty-stricken. In recent years, a policy of recruiting border protection staff has become a new means for locals to escape poverty. According to statistics from the Border Defense Corps of Xinjiang Armed Police Force, the population in the 205,000 square kilometers of border areas in Xinjiang is only about 1.2 million, with a density of less than six people per square kilometer. In order to monitor various situations along the border in real-time, locals must be mobilized to supplement troops and border guards. In recent years, large-scale recruitment of border protection staff from local populations has rolled out. Duties of patrol workers along the border vary in different areas but generally consist of patrols and cooperation with local police forces on crime prevention and control. According to Duan Hongming, first Party secretary of Tugurmiti Village, his village is the largest in the township. Already, 405 residents from 243 poverty-stricken households in the village were hired as border protection workers, so almost every poverty-stricken family has benefited. “If one member of a poverty-stricken household of four people is hired as a border protection worker, the whole family will be lifted out of poverty,” says Duan. Located in a mountainous area on the plateau, Tugurmiti Township features a ridged landform. Its border with the Kyrgyz Republic stretches more than 80 kilometers. Now, about 2,000 border protection workers reside in the township, accounting for 20 percent of the total population. These people, mostly aged 20 to 50 years, have lived there for generations. They are familiar with the local environment, nearby mountainous roads and various surrounding villages. In Tugurmiti Township, checkpoints are set up at 30 kilometers, 10 kilometers and five kilometers from the border. Border protection personnel live in specially built dorms. Every 15 people work as a group and shifts change every six to eight days. After completing their daily patrols, Mehmet Kasim and his co-workers brave the cold to chisel blocks of ice to melt for water for cooking and washing, perform drills or chat around a fire. 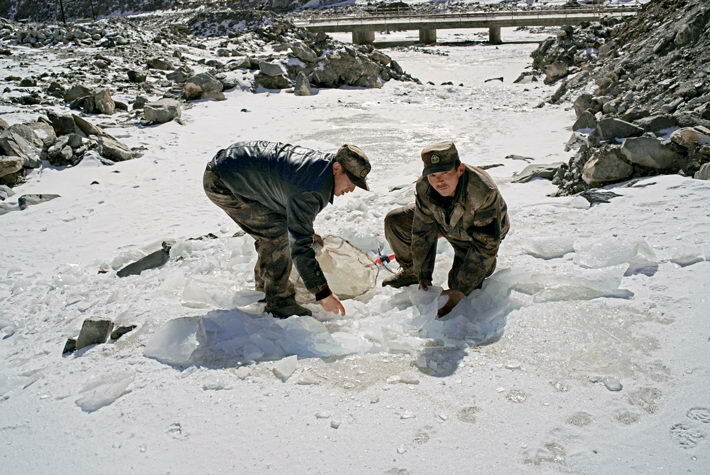 In Tugurmiti Township, border protection workers brave the cold to chisel blocks of ice to melt for water for cooking and washing in winter. Today, the profession of border protection is quite common in southern Xinjiang. In the Kashgar area, the narrow Wakhan Corridor traverses the Pamir Mountains and extends into Afghanistan. This narrow strip of land connects to Pakistan to the south and Tajikistan to the north. The section of the corridor in China is less than 20 kilometers wide and nearly 80 kilometers long, but features more than 10 mountain passes directly leading to foreign lands. Border protection workers venture as deep and far as the border stretches. Since the region encounters extreme weather patterns and features complicated landforms, wading through icy rivers and climbing snow-capped mountains above 5,000 or even 6,000 meters are common. About 80 kilometers from Atgayli is Xindie Village in Taxkorgan Tajik Autonomous County, hometown of border protection worker Niye Mollamet. Xindie Village now has a total of 76 border protection workers who rotate through 20-day shifts. Their dorms are located deep in the Wakhan Corridor, up to several dozen kilometers from the nearest village. In winter, the snow can get more than a meter deep. When Mollamet was caught in a heavy snow storm during a patrol, he held tight to his yak and continued trudging through the snow. “You need to fulfill your duties wholeheartedly against all difficulties,” he insists. Kashgar, Hotan and the Kizilsu Kyrgyz Autonomous Prefecture in southern Xinjiang are together listed as a whole among the 14 Chinese exceptional poverty areas across vast and contiguous stretches. Although the region is home to a comparatively small impoverished population, it covers a large geographical area inhabited mainly by ethnic minorities. Furthermore, most parts of the region are border areas. In recent years, the number of border protection workers has begun to multiply. Working in concert with other poverty reduction policies, the drive is beginning to help the region escape poverty. Locals have been encouraged to rise from poverty through multiple means. Xindie Village is a prime example. In 2017, the village’s per capita net income exceeded 8,200 yuan, and it had officially been lifted out of poverty. But locals were not content and still desired to expand their road to prosperity. That year, villagers planted 80 hectares of common sea buckthorn. They planted another 80 hectares in 2018, which are now flourishing. The village is already receiving orders from processing factories. Ripe sea buckthorn berries will be shipped to these factories within a couple of years. Locals plant sea buckthorn in Xindie Village. The village had officially been lifted out of poverty by 2017. But locals were not content and still desired to expand their road to prosperity. In Tugurmiti Village, support of the local government facilitated the establishment of cattle care centers to help border workers look after their livestock while they are away at work. Remahun Alim and his two brothers joined several impoverished families in the village in opening a shop to bake nang, a kind of crusty bread popular in Xinjiang. They earned a monthly income of 20,000-plus yuan and ended the tradition of locals traveling far to the city proper to purchase it. They voluntarily quit their jobs as border protection workers to give other villagers a chance for employment. “I think I can escape poverty on my own,” says Remahun Alim. The Kirgiz people are proud of their horse riding tradition. The village built a race track and developed a recreational area where entertainment projects such off-road motorcycling, dining, folk cultural activities, and valley tourism are offered. Mehmet Kasim and his fellow villagers feel their quality of life improving. “After shaking off poverty, we focus on building a beautiful village,” explains Duan Hongming. “We want our villagers to live a moderately prosperous life, both materially and spiritually.” Although a number of young people have relocated to bigger cities to work and study, many locals who have lived in border areas for generations remain committed to guard their homeland and national borders. “It is our honor,” says Mehmet Kasim.